Manetti Motorsport files away yet another weekend in Sarno, this time with the WSK Euro Series. During the weekend, all the drivers showed they had learned from the experience gained over the previous weekend, putting into practice the progress made. 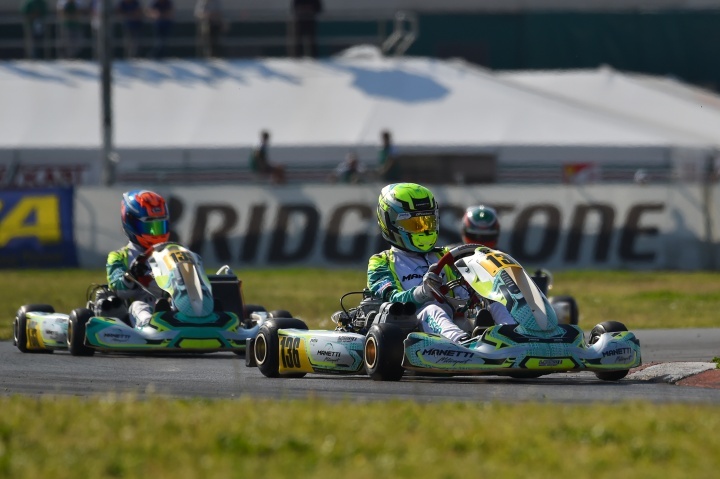 Luca Bosco (KZ2), Francesco Pizzi (KZ2), Lola Lovinfosse (OKJ) and Charlie Wurz (OKJ) were the weekend's protagonists, all gaining access to their respective category Finals. In the premier class, Luca Bosco and Francesco Pizzi defended themselves, showing competitiveness and speed right from the start. Luca Bosco continued his growth process obtaining the excellent sixth place in qualifying, eleventh overall and third for group C. A performance that Bosco used in the qualifying heats fighting for the leading positions. Three heats in progression allowed Bosco to position himself in eighth place in pre-final B, thanks to a 12th, a ninth and a sixth place in direct matches. On Sunday in Sarno, Bosco closed the prefinal in thirteenth, a useful result for the second qualifying in a row at the Sarno final. In the main event of the weekend, the KZ2 driver struggled at the start, managing to recover three positions with respect to the start, closing in 23rd position. "We brought home a nice weekend, the gap between the number ones was only 1 or 2 tenths. Starting behind drivers like Ardigò and in front of other top drivers on all the races was a nice progression for our fourth race. I'm happy for my penultimate heat where I managed to close in eighth place despite a steering problem. We were fast all weekend, we'll try to improve the starts. I want to thank Tony Kart, Vortex, Alessandro for Manetti and all my sponsors." Francesco Pizzi redeemed the Super Master Series weekend with a convincing performance. The Italian finished qualifying with fifth place in group D and the twentieth absolute time. Pizzi then fought in the heats despite some difficulties completing the program with a 16th, a 14th and an 18th place. In the Sunday pre-final, Pizzi gave his all, gaining three positions, useful for entering the KZ2 final. However, the decisive race reserved a bad sort for the Roman, who retired a few laps from the end. In the Junior we have two of the protagonists smiling, namely Lola Lovinfosse and Charlie Wurz. For the French driver, the Sarno event represented an absolute vendetta compared to seven days before for the Super Master Series. Lola Lovinfosse built up her weekend from qualifying with her seventh place overall in Group E. In Saturday's batteries, the young French driver surprised the competition with a tenth and an eighth place, completed by a fifteenth position and a retirement. With two positions gained in the final, Lola Lovinfosse was then able to close the prefinal in 15th position, valid for access to the decisive race. In the Finale of Sarno, Lola snatches the applause of fans and insiders with a noteworthy progression with a 14th final place and as many as fifteen positions gained! For Charlie Wurz, Sarno represented his absolute debut on the track. The Austrian did a good job with an eighth qualifying spot for group B, a tenth, a 14th, a 17th place and a retirement in direct clashes. Wurz then managed to get to the end of the Euro Series weekend by completing the prefinal in twelfth position with nine overtakes completed and the 23rd place in the final race. Also noteworthy was the excellent weekend of Gaia Bernasconi, involved in the first stage of the Swiss Karting Championship. Gaia held the top positions well throughout the weekend with seventh place in qualifying, and a double sixth placement in the two scheduled heats. In the category final, the Swiss driver was then forced to retire due to a race contact when she was in seventh position, just a few laps from the end. "It was a positive weekend, we were competitive! I want to thank my family that supports me at every race and my team for the great material and all those that support!"